AIRQUIN is used to furnish a shop display window of sports brand company called "Head". The Japan Self-Defense Forces have chosen “AIRQUIN” for their display at various events.AIRQUIN has also been featured in "PANZER", the only Japanese magazine specializing in ground defense equipment. AIRQUIN was shown up in Valentine Party of an emerging fashion underwear brand called "KISEKI" in Tokyo!! AIRQUIN is placed as display in a Korean TV show called　"Birth of Family", romantic trendy TV drama Monday-Friday on SBS Korea!! AIRQUIN can now be purchased on "Yahoo! shopping", the internet shopping site. AIRQUIN can now be purchased on "RAKUTEN ICHIBA", the internet shopping site. AIRQUIN used for display at "Kirna Zabete", the leading fashion select shop in SOHO, New York. AIRQUIN is used for display at ISETAN Shinjuku Store, Men’s Building B1F Men’s Shoes/Socks/Underwear/ Nightwear section. asics "TOKYO MARATHON 2011" campaign used AIRQUIN for their shop window display. department store that offers variety of hobby, home improvement and life style products. "NIKKEI MJ, a Japan's leading industrial newspaper", specialized on marketing, distributing, and consumer related businesses. AIRQUIN featured in April edition of "NIKKEI TRENDY -7 Tools for Professionals", magazine that introduces latest trends and well selling items. 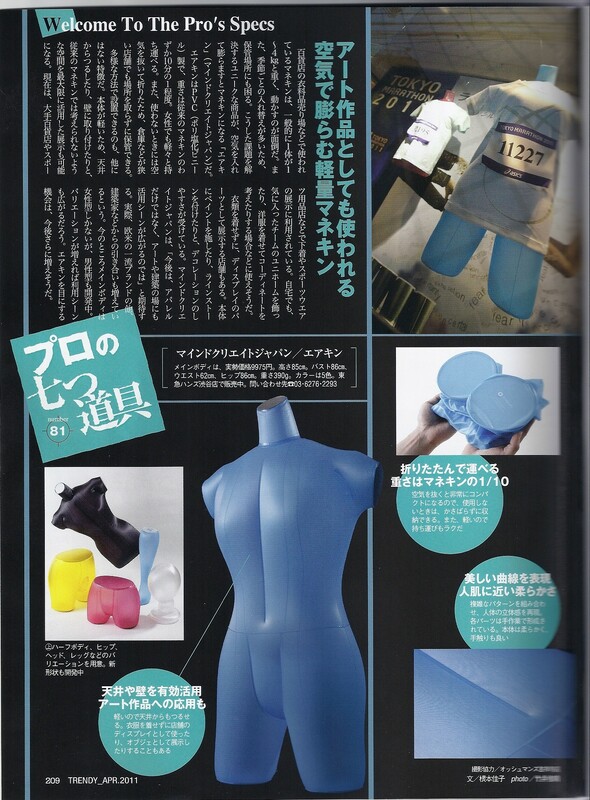 AIRQUIN featured in "HANSOKU KAIGI - Item of This Month", the magazine for advertizings and sales promotions. AIRQUIN introduced on TV Tokyo "World Business Satellite 'Trend TAMAGO'"